These tickets are good for entrance to one park per day, either Disneyland Park or Disney California Adventure. The price of a 1 Day ticket varies depending on when you'll be visiting: Regular period, Value period, or Peak period. 1 or 2 days of same-day entry into both Disneyland park and Disney California Adventure with park hopping privileges. Park Hopper Bonus Tickets expire 13 days from the day of first use or January 13, 2018, whichever occurs first. First day of use of a ticket constitutes one full day of use. 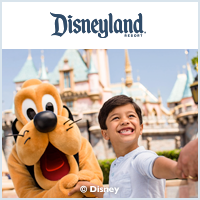 2018 Southern California City Pass – Advance Purchase Online Includes admission to Legoland California, SeaWorld Adventure Park , and a 3-Day Disneyland Resort Park Hopper Bonus Ticket. 365 days of admission into both Disneyland Resort theme parks and unlimited enjoyment of adventures and attractions (except arcades) during regular operating hours. Complimentary parking in the "Mickey and Friends" parking structure or "Toy Story" parking lot (subject to availability). 20% merchandise discount throughout the Disneyland Resort ($10 minimum purchase; other restrictions apply). 10%-15% dining discount at select Disneyland Resort dining facilities. (Minimum purchase and other restrictions apply). Exclusive benefits at select Downtown Disney District locations. 350 days of admission into both Disneyland Resort theme parks and unlimited enjoyment of adventures and attractions (except arcades) during regular operating hours. 320 days of admission into both Disneyland Resort theme parks and unlimited enjoyment of adventures and attractions (except arcades) during regular operating hours. 10% merchandise discount throughout the Disneyland Resort ($10 minimum purchase; other restrictions apply). 365 days of admission into both Disneyland Resort theme parks AND all Walt Disney World Resort theme parks and water parks during regular operating hours. A portion of the cost of the Premier Passport is taxable. 229 pre-selected days of admission to both Disneyland Resort theme parks and unlimited enjoyment of attractions (except arcades and midway games) during regular operating hours. 175 pre-selected days of admission to both Disneyland Resort theme parks and unlimited enjoyment of attractions (except arcades and midway games) during regular operating hours.